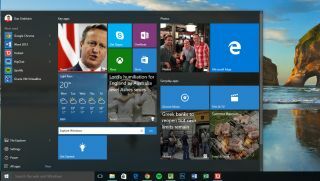 Microsoft has unveiled the next preview build of Windows 10 for PCs and large-format tablets. Build 10525 features enhanced customization options and a better way to automatically manage memory usage. The new build is an example of how Microsoft plans to test changes for Windows 10, which will now include mandatory sporadic updates. Microsoft will test a new build and then, after a satisfactory trial period, make the new features and fixes available to the general public. For this build, Windows 10 users stressed the importance of color enhancement options for the Start, Acton Center, Taskbar and Title bars, which in previous builds had been set to a default bluish gray. Now, with Build 10525, you can go in and edit the color to your heart's content. It is immediately unclear what the color options are, but we'll head in and give the new build a perusing tonight. Microsoft is also touting the advantages of its new Memory Manager setting, which compresses unused files and activities - rather than writing them to disk - in order to reduce the amount of memory used per process. Essentially, your computer will be leveraging in-memory computing to minimize the size of inactive files in order to provide faster response times to your actions. Several issues exist within Build 10525. Mobile hotspots will not get a valid IP address from external devices, so you won't be able to access the web without a Wi-Fi or ethernet connection. Optional language packs will not be available, but Microsoft said it will add them to the build later this week. Microsoft recently made the next version of Windows 10 Mobile available to testers. The updated preview, Build 10512, features improvements to overall performance, as well as interface changes and bug fixes. The mobile version of the operating system is expected to be complete in November. The first devices to get the mobile version will be the Lumia 430, Lumia 435, Lumia 532, Lumia 535, Lumia 540, Lumia 640, Lumia 640 XL, Lumia 735, Lumia 830, and Lumia 930.